This divergent light effect was observed around power cables that reflected light from a bright lamp. The lamp was positioned behind and above the cables. 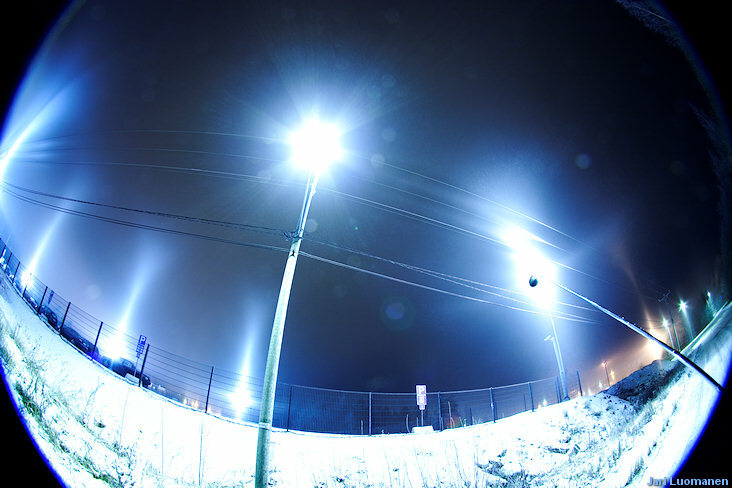 The bulb of the floodlight can be seen through the dark filter. 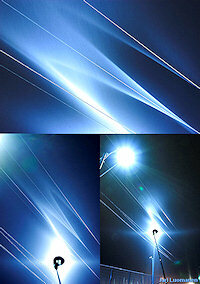 The photographs were shot between 1 and 2 am, 29 November 2007 in Tampere, Finland. At the time of the observation the ambient temperature was -4 - -3 degrees Celsius. The cables’ surface appears to reflect light very well. The effect was visible from a rather narrow sector only. As the observer moved sideways, the effect disappeared. At the peak of its intensity, when the telephoto shot was taken, it was very bright. The effect was clearly defined as is shown in the photographs. Divergent light parhelia as well as upper and lower tangent arcs were also observed. The divergent light upper tangent arc can be distinguished as the diffuse glow above the lamp. In the telephoto shot it manifests itself in the individual crystal trails between the camera and the cables. In this sense, the image shows two halos on top of each other. Strong pillars and UTAs were observed above light sources further away (see image 2). The effect around the cables had a 3D appearance, like a vortex or a funnel, but it did not extend towards the observer. Rather, it seemed to encapsule the cable. The other halos that formed in the light of this lamp had a strong 3D character. Both tangent arcs as well as the parhelia arched along the Minnaert’s cigar from the eye of the observer towards the lamp. Unfortunately, this 3D effect cannot be satisfactorily captured in a still photograph. Earlier that night it had proved difficult to photograph crystal samples due to high temperature. Towards the end of the display the temperature had risen to -3 degrees Celsius. Hence, no crystals were photographed during the observation. However, the known halos observed suggest that singly oriented columns and plates were prominent in the crystal population. At the time of the writing (10 December 2007), the cause of the effect remains unknown. Hypothesises concerning the nature of the effect are most welcome as are previous observations in case there are any. For larger images, see here. Way odd effect, Jari. From now on gotta start taking some cable along with the lamp when going out. Hopefully some brains will emerge to solve this. Jari, this is one of the most bizarre things I have ever seen. Since Marko's 120° divergent light parhelia, I've become really interested in divergent light phenomena. Now this really makes me think. Thanks for sharing the photo and congratulations! Marko, indeed, the stuff just keeps adding up. :) But seriously, I too hope we can figure this out. Ágnes, thanks, it really is puzzling. Today I added a new picture to the post - it gives yet a wider view to the scene. It also gives a hint about the extent of the divergent light effect. And it wouldn't harm if you'd add this blog to www.blogilista.fi too. That way it would be easier to follow this (for those of us who don't use RSS-readers). You'd probably get more readers also. Jari, this is an exciting case! I wonder whether the phenomenon was bright enough to be captured by a video camera. It would be interesting to see the behaviour of those strange effects when the view angle changes. I tried to capture some video with my cell phone but, perhaps unsurprisingly, it did not come out too well. It's just a sequence of pixelated blur. In any case, I'm sure that any semi-decent video camera would easily capture this. I should try it with our point & shoot camera next time. What a beautiful observation Jari, congratulations! The light of the lamp is reflected by a cable into a cone of light that lies coaxial with the cable. The part of this cone that is directed upward is most intense, since the effective cross-section of the cable at grazing incidence is very small. The upward part of the reflected cone of light is then reflected once again by basal faces of horizontal plate crystals that float above the cable, and then reaches your eye. If these crystals were all floating in a two-dimensional plane at some distance above the cable you would just see a light curve at the cross-section of the cone with that plane, which is in this case a hyperbola (since the cable and therefore the cone axis are approximately horizontal). Here, the reflective crystals are obviously in a three-dimensional cloud, and the simple cross-section of the cone with the "plane" becomes a 3D caustic formed by all such imaginary cross-sectional hyperbolas at different altitudes, starting right at the cable and upward, extending away from the observer. Each imaginary hyperbola-cross-section is shifted away from the light source further along the cable, and at higher altitude. It is hard for me to visualize it, but what you would see is (I think) exactly what you are seeing. That most of the light is reflected upward by the cable and then downward by the crystal basal faces would be the reason that you were not seeing the phenomenon extend down towards you. The narrow angle of observation would be explained by arguing that the 3-D caustic may be very flat but extensive along the imaginary plane formed by the observer and cable. So you'd see the caustic contrast well with the dark background only when you look almost edge-on to the caustic. It should be possible (and I would be very interested) to simulate this by computer and see if the above attempt at explanation would be correct or not. When you see this again, try taking stereo photos to show us in addition to video It would be very interesting to actually see the 3D caustic that way. Wow that is amazing its like the power lines have a "halo tube" I wonder if light hitting the cables is reflecting off to form the light tubes. Thanks for sharing your thoughts on this! I agree that there is a cone of light coaxial to the cable. The cable could also be thought of as a line consisting of an infinite number of point (divergent) light sources, each producing a "slice" of the cone, creating a part of the effect. Hence, we are seeing the sum effect of these points. As to the relative intensities of the cone in various directions I'm not sure I understand how it is most intensive in the upward direction. Or do you mean generally on that side of the cable? At first I suspected singly oriented columns might be the culprits here as UTAs were so strong, but as Jarmo Moilanen noted, it is always best to start with the simplest explanation. Light reflected off the basal faces of plates is the most likely cause for this effect. Since no colours can be seen, refraction can be ruled out with virtual certainty. However, whether this is the equivalent of a pillar with a conical light source is an interesting question. Pillars need plates with large tilts and yet, this effect is very sharply defined. Could it be the equivalent of a subsun instead? Thanks to Jarmo Moilanen for his comments on this. There were pillars above other light sources, but not downwards as far as I can tell. I've been browsing through the photorgaphs and they support this. Parhelia were also observed. I did not observe a subsun in the light of this lamp though. It is possible that I simply missed it against the snow white of the ground, being so busy to operate the camera and watch my back as I was shooting practically in the middle of a road. Capturing stereo photographs is an intriguing idea. In the least, I will try capturing video with another camera. On the other hand, lit by these types of lamps, the other halos are colourless as well. For example, UTAs show no colours. In any case I'd still wager a guess this most likely is not a refraction halo. The new home for the larger images is here.